Everyone enjoys getting mail, but during the holiday season, every letter gets a bit more attention. From a real estate agent’s point of view, then, this is the key time to begin networking and building your reach. We will show you how easy it is to perform real estate farming using direct mail; specifically with holiday themed materials. Holiday greeting cards are by far one of the most effective brand-building tools real estate agents have during the season. This is the ideal goodwill gesture your firm can make. And, it is a proven marketing tool. From the end of November through the first week of January, you have a prime opportunity to distribute holiday cards to your community. Why Does This Direct Mail Opportunity Matter? For many agents, sending a holiday card is just good form. Business etiquette would encourage you to send a card during this time of the year to show respect to your previous clients. A simple, formal greeting card can communicate that you are thinking of them. Holiday cards are also the ideal way to say thank you to your clients. This is especially important for those who closed a deal with you this year. Sending a special message of gratitude at Thanksgiving shows your client you appreciate them. Through the use of holiday greeting cards, it is possible for real estate agents to connect within the community. Create a personalized message to those in a prime neighborhood. Connect with old clients who may be back in the market. Show existing clients how much you value them, so they can help encourage others to work with you. While holiday greeting cards are a straightforward direct mail campaign, you may wish to send specific clients a new calendar for the upcoming year or a special magnet with your contact information on it. These types of gifts can help to solidify your organization’s name and branding message for years to come. More so, it helps you to build a community-first image your would-be home buyers and sellers can appreciate and remember when they need your services. 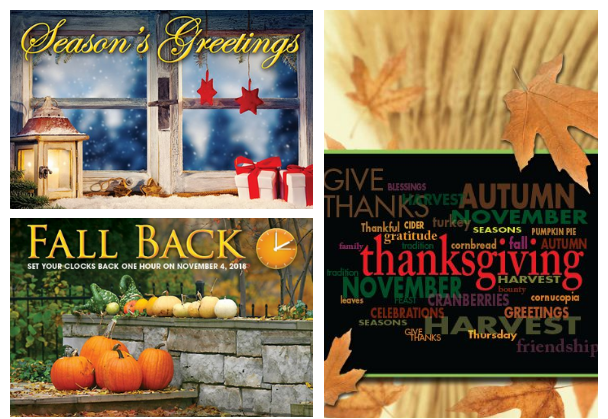 Reamark offers several options including pre-printed and personalized greeting cards. Be sure to check our special savings area. We have many holiday themed materials in our clearance section.